Distraction and I are well acquainted. When I’m unable to come up with ideas for images the best way for me to break out of my photographer’s block is to go do something and let distraction lead me away. For a while I thought that I should have a better “method” of coming up with creative ideas. I mean it seemed silly that a grown woman would be so easily distracted by something shiny . (Shiny in this case meaning something not related to what I am doing at the time) I had tried taking the time to just sit and plan future images. I sat in a quiet area with a notebook and a pencil and prepared to let the ideas flow. No wrong ideas, no bad ideas, just ideas. All ideas were going to be written down and looked at objectively later. But before I knew it an hour had passed and no ideas had came to me. Not even “bad ones”. After trying this three or four times I realized that the “pencil and notebook” stream of creative consciousness system for generating ideas was not for me. I needed to follow my familiar way and let distraction lead me to ideas. All I need is to start doing something, anything, as long as it’s physical, then the distractions will come and the ideas flow. It’s not a perfect system. Occasionally, like last Saturday, my distraction method may get in the way of actually completing a task. I went out to water the gardens in my front yard. Just before turning on the water I noticed how pretty the sunlight is shining on the sundews. So I go into the house and get my camera. 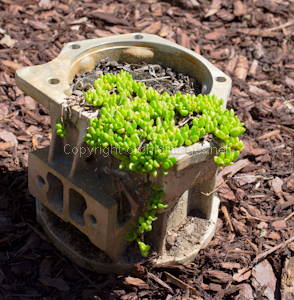 I take pictures of the sundews and turn to see a planter my husband had made me out of a jeep part. It looked so whimsical with a plant growing out of it that I spent a solid fifteen minutes moving it around to get it in the best light for photos. During this time the county trash trucks had been through so I went to the street and hauled back my trash cans. On my way back from the street the warmth of the sun made me remember that I needed to put out some sun tea. I went inside and made up the jug of tea and put it out on the back deck to steep. Then came back inside, got a cold drink and collapsed in a chair to check my email. At no time had I watered the plants. Later that Saturday I did make it back outside to water the front gardens. 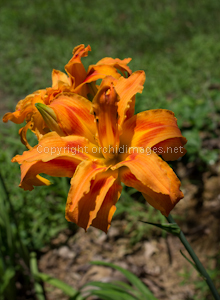 While out there I noticed that the day lilies had opened some more blooms. Earlier in the week I had planned on taking photos of them but all of the open blooms were too tall for me to easily photograph the way I wanted. These newly opened blooms were just at the right height. This time I finished the watering before getting my camera. Then it was picture time. After capturing the lilies I turned my attention to the straw bale garden. I finished with a walk around the yard but no more distractions, or ideas, came to me. Where was I? Oh that’s right, I was talking about distraction. Distraction is a flow of ideas that need only be captured and executed. Following the shiny distractions that come into my life help my creative process. They also jog my memory of images I meant to create but for some reason didn’t. They show me images that I may never have thought to create by just sitting with a pencil and a notebook. Creation by distraction may not be a new concept. I’ve never tried to research it. But give it a try. Allow yourself to let your mind drift while your hands are busy. Go fold some laundry, water the garden, walk the dog. While I am looking for images to create someone else may be looking for ideas to write about or clothes to design. Shiny things are there for a purpose. They give us a reason to look in a direction we may never have thought to look on our own. Embrace the distractions when you are trying to be creative. Everyone needs to look at a shiny now and again. This entry was posted in inspiration and tagged block, create, distraction, gardens, ideas, images, inspiration, look a shiny, photographer's block, photography, shiny. Bookmark the permalink. I use this method too, setting the mind free while you do a menial task works well.